When a domain expires, your website and mail service will stop functioning, and no changes can be made to the domain. However, for generic TLDs (.com, .net, .org, .biz, .info, etc. ), you have a period of about 30 days at Philmorehost after the actual expiration date during which you can still renew the domain at the regular rate. A full list of generic TLDs can be found on the Domain Name Search page. 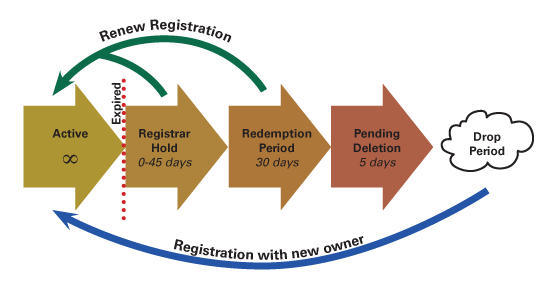 If you do not renew the domain within this grace period, it enters a redemption stage for 30 days at the Registry. At this stage, the domain may be auctioned off by the upstream vendors. As an owner, you still have an option to return the domain at this stage (if it’s not auctioned off) at a redemption fee (you can contact our Support team to check what would be the exact fee for your domain) plus its regular renewal cost. If the domain is not recovered from redemption, it enters a Pending Delete stage at the Registry for 5 days. On the 6th day, the domain should be released to the public for re-registration. Normally, generic TLDs get released approximately in 70-80 days (in rare cases, up to 120 days) after the expiration date if not returned from redemption and if not auctioned off. Please note that once the domain has been released, the registration is carried out on a first come, first served basis.